Filters are low-tech, in-home filtration systems that remove up to 98% of water pathogens and last a lifetime. Seeds of Hope has constructed hundreds of BioSand Filters at the Ndola Resource Center, installed them dirrectly into community members homes, and conducted follow ups. 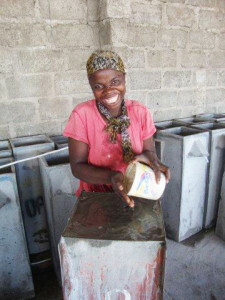 SoHIP also trains community members to build their own. The BioSand filter is an innovation on traditional slow sand water filters, having been specifically designed for intermittent use. sand filtration has been used for centuries. The filter can be produced locally anywhere in the world because it is built using materials that are readily available. It is simply a concrete container, enclosing layers of sand and gravel whose purpose is to eliminate sediments, pathogens and other impurities from the water. It is in use in homes in over 70 countries around the world. Operating the filter is very simple: remove the lid, pour a bucket of water into the filter, and immediately collect the treated water in a container. Because of its smaller surface area, the filter can produce up to 36 liters/hour. When water is poured into the top of the filter, a diffuser plate placed above the sand bed dissipates the initial force of the water. Traveling slowly through the sand bed, the water then passes through several layers of gravel and collects in a pipe at the base of the filter. At this point, the water is propelled through plastic piping encased in the concrete exterior, and out of the filter, for the user to collect. 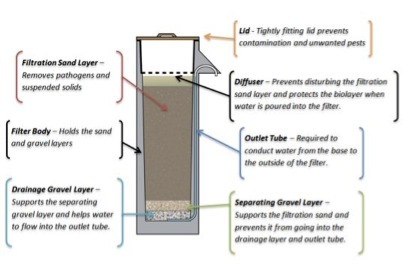 As with all slow sand filters, the removal of pathogens occurs in the BioSand filter due to a combination of biological and mechanical processes. When water is poured into the top of the filter, the organic material it is carrying is trapped at the surface of the fine sand, forming a biological layer or ‘schmutzdecke’. Over a period of one to three weeks, micro-organisms colonize the schmutzdecke, where organic food and oxygen derived from the water abounds. The schmutzdecke micro-organisms consume bacteria and other pathogens found in the water, thereby providing highly effective water treatment. It mirrors the process that is used in nature to purify water around the world. Pathogens are removed due to food scarcity and less than optimal temperatures. Viruses are absorbed (become attached) to the sand grains. Once attached, they are metabolized by the cells or are inactivated by antiviral chemicals produced by the organisms in the filter. Certain organic compounds are also adsorbed to the sand and thus removed from the water. Sediments, cysts and worms are removed from the water by becoming trapped in the spaces between the sand grains. When precipitated, the filter can remove some inorganic compounds and metals from the water. Slow sand filters have been proven to almost entirely remove the disease-causing organisms found in water.The BioSand technological adaptation of slow sand filtration has proven as effective as traditional slow sand filters, in both laboratory and field tests. In conjunction with the introduction of the technology to communities, the filter has been tested by various government, research, and health institutions, as well as by non-governmental agencies. 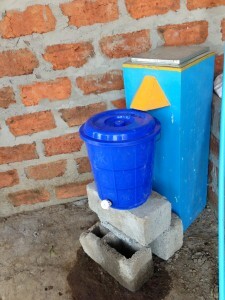 Want more information about how and where are BioSand Filters fabricated?